MAN I wish I had the problem of needing to GAIN weight! I also wish I could take a few of my pounds and loan them to my daughter… and tell her, no need to return them! Her weight on Thursday was stable… pretty much no change. At least she didn’t loose weight! 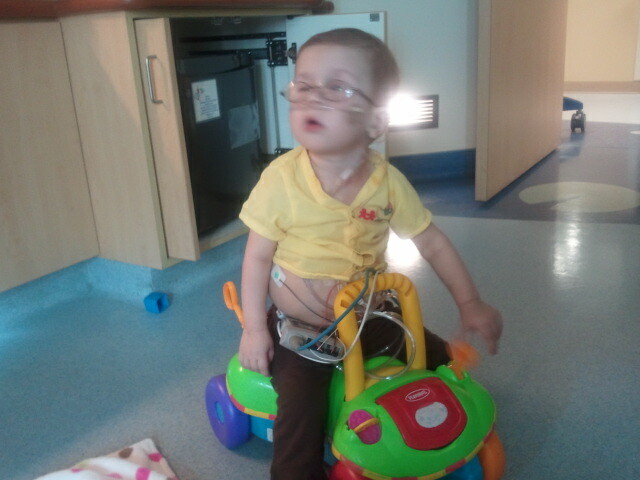 Her respiratory status is MUCH MUCH better. We had a scare on Wednesday when she went down for nap, she dropped to a SAT of 70! YIKES! A lot of oxygen… and some lasix… and she went right back up. Since then, she has done MUCH better. She was off oxygen almost all day Thursday, besides a few dips during feeding times and during sleep times, but she was on oxygen at home while she slept anyway, so that is to be expected. She is MUCH less snotty… a little congested still at times when things settle in there but for the most part, we are super pleased! On Wednesday, we decided her new formula wasn’t working. She was just vomiting WAY too much. So we switched yet again, this time to a non-milk based medical formula. It has NO milk protein… all manufactured proteins instead. This was NOT what I wanted to do, mostly because the Mommy in me didn’t want to admit that she might have a milk protein allergy… (can we say DENIAL?!?) but if it makes her better and able to go home, then bring it on. At first, it did not. She still threw up for 2 feeds. But then Thursday she did much better. No vomit, although she still did wretch quite a bit. THis morning though, she threw up again with her first feed. Will monitor through the day and reassess tomorrow. Her stool is still super watery though. That may just take time to adjust. 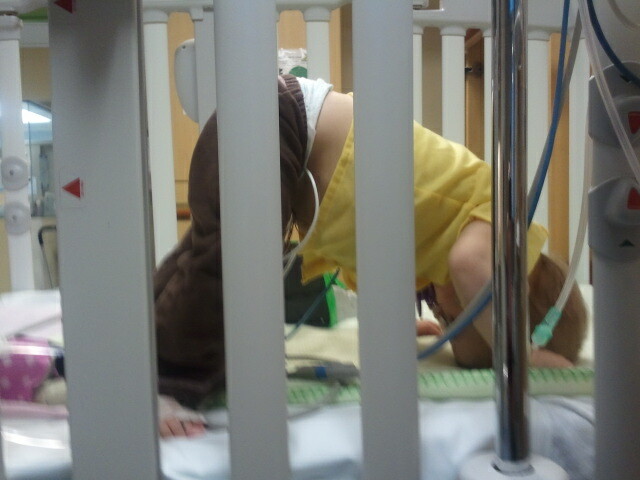 Currently, the plan is to watch her through the weekend and monitor, and potentially go home on Monday. If they let us go earlier than that… well WOOHOO is all I have to say to that! I’m planning and counting on Monday though! And praying hard it isn’t later than that. Also… they had mercy on poor worrying Mommy and are doing a few tests just to really REALLY rule out anything with her heart. 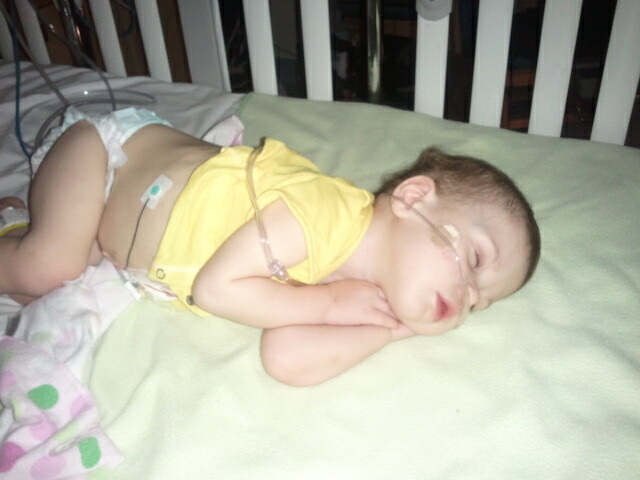 I know she has RSV. I KNOW all her symptoms point to that. My Mommy heart already feels SO SO SO much better just knowing that we’re checking all the bases! They also reassured me that they understand the feeding thing is an Annabelle thing and not a Mommy thing. In the deep reassesses of my brain (okay, maybe not so deep, in the forefront really!) I’d been fearing that everyone thought I wasn’t doing enough at home to feed my baby, that I wasn’t being a good Mommy to her and that is why they wanted to do all this in the hospital. There, I said it. Blah. I know it sounds dumb. But it was super bothering me and hurting my heart in a really big way. I care about my Annabelle more than I could ever ever express. I chastise myself on a daily basis about all the things I could do better, and I’m my own worse critic, I know, but the thought of people AGREEING with my inner critic, that I wasn’t being a good Mommy… well it just broke my heart and spirit a little. This is NOT something I was going to share here. But I’ve always been super honest here and I figure why stop now, hm? Anyway, the transplant nurse and I had a good talk about it all and I feel a ton better, and *sigh*. Being a heart-momma is not easy. It comes with a lot of worry (that yes, I KNOW I need to give to God…) and a lot of self-doubt. I’m just super thankful today to have a team of doctors caring for my daughter that understands all that too and doesn’t roll their eyes at over-sensitive Momma’s! Daddy came to visit today!!!! It is his one day off work, so he came super late last night and stayed the night, and gets to visit Annabelle for a good while today. Mommy and Annabelle missed him!!!!! A few fun (albeit blurry…) pictures…. 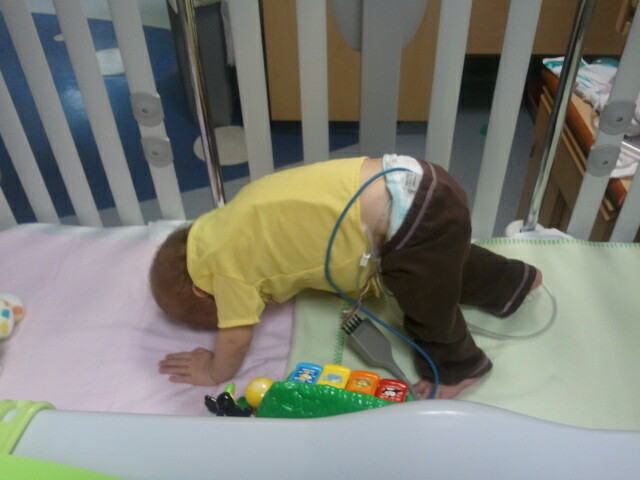 Annabelle has decided she wants to be a gymnast!!! I was almost holding my breath expecting a somersault! Another view… she was looking through her legs! Sleepy Annabelle!!!!! MAN I love that girl!!! I always worried that 'they' thought I wasn't doing enough, even tho' they assured me many times, that so many concerns/issues were related to my child and the situation she was in. Relax, deep breath, enjoy…..something!! If it makes you feel any better, I am NOT a heart Momma, and I STILL have those feeling of "am I doing everything right? Could I do something better? All of those other 'perfect' moms out there probably have supper cooked every night, a clean house, and kids in the bed by 8pm every night." Take a deep breath and pat yourself on the back, lady! You're doing great!!! KP, her belly looks really distended. Is that because of the trouble with her formula? Ah, sweetie. I can't fully understand everything – I doubt many can – but I did have a kiddo who was failure to thrive for nearly 18 months. I remember well those fears. Going to the doc office to find out he'd lost HALF A POUND in a week and was back in the 7.5lb range at 3 months. Sitting there in tears waiting for the nurse practitioner after the nurse left and hoping and praying she knew I was doing everything I possibly could to feed him. And wondering if/when they'd feel obligated to call me in to DFS. I'll never forget the day she wrapped her arm around me and gave me a big ole hug and said "We know you're doing everything you can. This is Not. Your. Fault. And none of us think it is." Eventually, he had a Nissen. That helped. For a while. But he still wouldn't grow. So they sent us to a specialist. They put him on a special diet. Eventually, he out grew needing that too. But I remember. I'm so very glad you've got a wonderful team who understands your concerns and your heart and can help put you at ease. As much as possible. Aw, I love that picture of her sleeping. Why do we deal with that Mommy guilt? It stinks. And I totally understand the "what if they agree with my inner critic"…man, that's the story of my life!! Thanks for being so honest here, Krista. I hope that you get to write from home soon! !